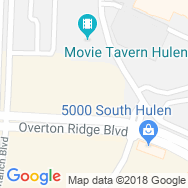 Rally House Hulen is located 9 miles northwest of Fort Worth, Texas, between Chisholm Trail Pkwy and I-20 Highway, at the southwest outskirts of the Hulen Mall. Head southwest on S. Hulen Street from I-20 Highway, turn onto Overton Ridge Blvd and find us on your right. Step off the plate and into Rally House Hulen this season to look your best on gameday and find a game-winning selection of Pro sports apparel. Shop popular Dallas Cowboys jerseys, Texas Rangers jerseys, Dallas Stars sweatshirts and sharp-looking Dallas Mavericks hats. Discover men's popular t-shirt designs and the latest women's clothing trends while you stock up on your college team colors! Stop into Rally House Hulen for all your NCAA gear needs. Shop a great selection of TCU Horned Frogs apparel, Texas Longhorns tees, TTU Red Raiders drinkware, Texas A&M socks and Baylor Bears room decor. Find gear for out-of-state teams too, like Oklahoma Sooners, OSU Cowboys, LSU Tigers and Arkansas Razorbacks. You'll find all the college and pro sportswear you need at Rally House Hulen. Stop in today and show your colors! We know you love the Dallas metro as much as we do. The late nights at Globe Life Park, the chilly Sundays at AT&T Stadium, and the action-packed matches at American Airlines Center fuel this city. Whether you're a local representing your city or a visitor travelling through, Rally House has Dallas apparel perfect for your style and Texas souvenirs to commemorate your road trip. Shop our local collections to represent Dallas and TX with Dallas apparel, USA merchandise. Regardless of which city, area or team you love to represent, we can all show our RALLY!